The above is a copy of the initial table from this week's Natural Gas Storage Report, covering the changes of natural gas in US storage for the week ending January 5th. The first column of numbers shows the amount of natural gas in billions of cubic feet that was left stored in each US region and naturally as of January 5th; the 2nd column shows the amount of natural gas in billions of cubic feet that had been stored as of a week earlier, ie, as of December 29th, and the 3rd column shows the change between the two. 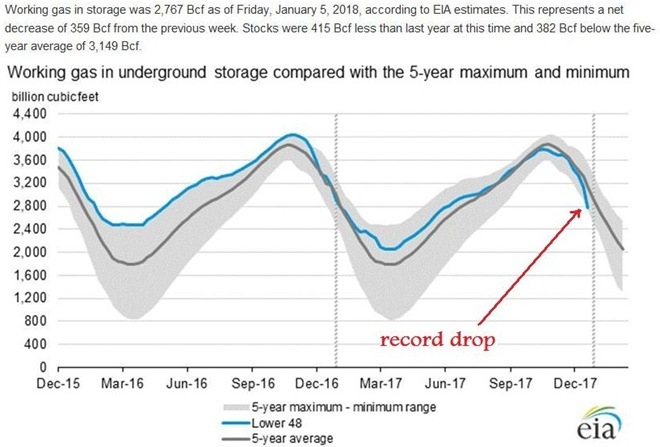 Then, in the columns on the right, we have similar totals of natural gas in storage during the same week a year ago, and the 5 year averages for this time of year. Thus, we see that the US started the week with 3,126 billion of cubic feet of natural gas in storage, and by the end of the week that had fallen to 2,767 billion of cubic feet, which means we used 11.5% of all the natural gas we had in the entire country in just one short week. With just 2,767 billion of cubic feet left at the end of the week, that quite simply means that if we continue using natural gas from storage at the same 359 billion cubic feet rate that we used it this week, we'll run out of it in 8 weeks, completely. There will be no natural gas left in the entire country. Period. Next, we'll show you a chart of our natural gas supplies over time so you can see how this week's drop stands out. To the best of my knowledge, the EIA does not publish weekly natural gas production figures, or how much gas comes out of US wells each week. They do publish monthly natural gas production figures, however, with a couple month lag for the time it takes them to compile accurate data. Looking at that data, we can see that over the first 10 months of 2017, US natural gas production totaled 22,113 billion cubic feet, or an average of 2,211.3 billion cubic feet per month. There are 304 days during the first ten months of the year, so that means our average daily natural gas production was 72.74 billion cubic feet during 2017. Multiplying that by 7 gives us a average weekly natural gas production of 509.18 billion cubic feet for the first ten months of the year. If that average held through to the first of the new year, that suggests that during the week ending January 5th, we used that 509 billion cubic feet of production, plus the 359 billion cubic feet of natural gas we took out of storage, for an approximate total of 868 billion cubic feet of natural gas consumption for the week ending January 5th. Put another way, by using 868 billion cubic feet during that week, we were using 70% more natural gas than what we were producing. 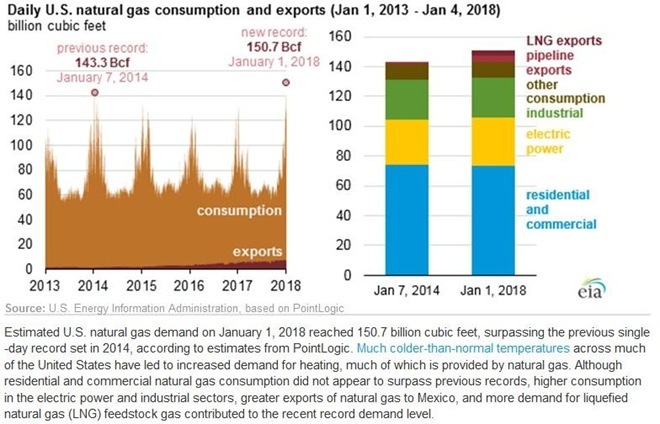 On the right of that brown graph, the EIA presents a bar graph that highlights the differences in natural gas usage between the old single day record and the new one set on New Year's day. 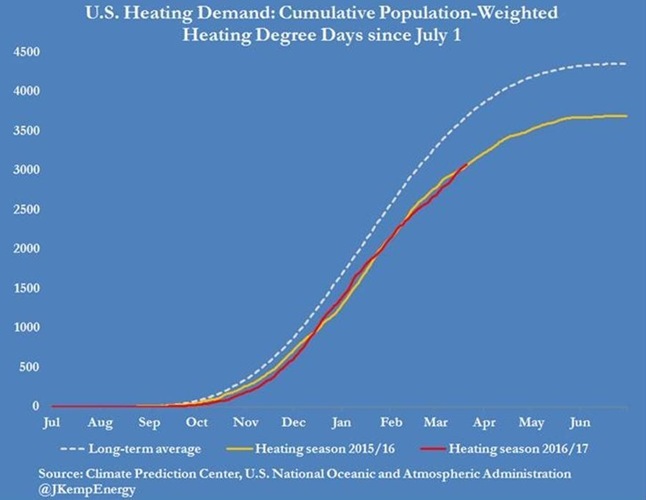 The blue part of each bar represents the portion of the day's natural gas consumption that was used for heating, and it's pretty obvious that heating use was greater on January 7th 2014 than on January 1st of this year. Next, the yellow part of each bar is that portion of each day's natural gas consumption that was used for power generation, and here the 2018 record clearly tops the power usage of old record in 2014. Industrial usage of natural gas, shown in green, may have also been greater on 1/1/18 than on 1/7/14, but not by much. "Other" usage of gas, shown in brown, was also quite close to the old record. But the big difference, shown in shaded of red at the top of the bars, was our natural gas exports, by pipeline to Mexico in cheery and as LNG in sangria by tanker to destinations world wide, that really put this week's record gas demand over the top. From here, the shortfalls of natural gas supplies during winter will only get worse. For instance, earlier this year, the EIA projected that natural gas for power generation would increase by 8% in 2018. That would add nearly 3 billion cubic feet more to daily demand. But the real issue going forward is going to be increasing LNG exports, which, based on those liquefaction facilities already under construction, could easily triple by the end of next winter. Since much of the natural gas that the power plants and the LNG exporters will be using is already under contract at the near record low prices that natural gas has been quoted at over the past few years, it will be the residential and commercial users that will be paying the higher prices that the coming shortage of natural gas will inevitably precipitate. A cold-snap? Where was this? Would you believe that between January 4th, 2018 and January 15th, 2018 that Metro-Denver averaged just under 16 F worth of anomaly on an average basis among more than 40 global trade competitors?